Triple layer anything is enticing, but a triple-layer chocolate dessert is, well...off the rails. 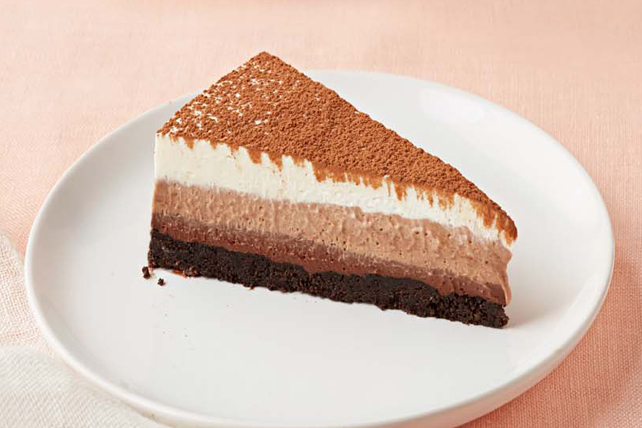 That's why our Triple-Layer Chocolate Mousse Dessert is a must-try! Line 8-inch square pan with foil, with ends of foil extending over sides. Process cookies in food processor until finely ground; mix with margarine. Press onto bottom of prepared pan. Place 3 oz. semi-sweet chocolate in medium microwaveable bowl; add 2 Tbsp. milk. Microwave on HIGH 30 sec. ; stir until chocolate is completely melted and mixture is well blended. Repeat with 2 oz. white chocolate and 2 Tbsp. milk in separate microwaveable bowl. Then, repeat with remaining semi-sweet chocolate, remaining white chocolate and 2 Tbsp. of the remaining milk in third microwaveable bowl. Cool. Beat pudding mix and remaining milk in medium bowl with whisk 2 min. Stir 1/3 cup pudding mixture and 2 tsp. cocoa powder into melted semi-sweet chocolate. Stir 1/3 cup of the remaining pudding mixture into each of the remaining 2 bowls of melted chocolate until blended. Gently stir 1 cup Cool Whip into chocolate mixture in each bowl. Layer pudding mixtures over crust, starting with semi-sweet/cocoa mixture and ending with white chocolate mixture, smoothing top of each layer before adding the next. Refrigerate 4 hours or until firm. Use foil handles to remove dessert from pan just before serving. Sprinkle lightly with remaining cocoa powder. Cut into 9 squares, then cut each square diagonally in half. Substitute Baker's Bittersweet Chocolate for the semi-sweet chocolate.